Volunteers are extraordinary people who give their skills, life experience, time and expertise to help others. 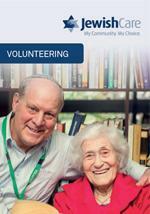 They are an integral part of the Jewish Care family. Our passionate and dedicated volunteers provide direct assistance to our clients and Elders through social, recreational, cultural and spiritual activities. They also support fundraising and community engagement, participate in committees and corporate governance and much more. Our volunteers come from various religious and ethnic backgrounds and range from university students, families, working adults, retirees and Jewish Care residents to their relatives. reducing isolation and increasing socialisation. Most volunteers will tell you they get as much out of volunteering as they give. As a volunteer, you become part of a team making a valuable contribution to the community, but you can also benefit personally. For more information about volunteering, download the brochure below and call Hayley on (03) 8517 5734 or submit an online enquiry.